Does A Short Sale In Florida Ruin Credit? If you can no longer make your mortgage payments and you want to avoid going through foreclosure (where the lender declares that it will sell your property to the highest bidder unless payments are brought up to date), you can ask your Florida mortgage lender to agree to a short sale in Florida. That is, to allow you to sell your home for less than the amount currently owed. Although you benefit in the short term by the lender agreeing to write off the difference, in the long term, a short sale in Florida will negatively impact your credit. The good news, however, is that your credit is not ruined for life. While a negative credit remains on your credit report for seven years, you can be eligible for another loan after only two years. Moreover, good credit behavior can reverse your negative credit history even while the derogatory item remains. In order to qualify for the short sale of a home in default, the seller must substantiate that the home’s market value has dropped (i.e., the home is worth less than the unpaid balance due). The seller must submit a “letter of hardship” explaining why he can no longer make the monthly mortgage payments or pay the difference owed upon sale. Examples of hardship include bankruptcy, sudden illness, unemployment and divorce. Further, the lender will carefully examine all financial records to verify that the seller has no assets that can be used to pay the shorted difference. How Much Is Credit Affected In A Short Sale In Florida? Even if the lender agrees to a short sale and a buyer makes an offer, if you are in default on your home, your credit report will be damaged. Appearing on the report as “pre-foreclosure that has been redeemed,” or “paid in full for less than agreed,” short sales affect your credit rating in the following way. The Fair Isaac Corporation (FICO), the corporation that developed the credit-scoring formula, estimates that the average points lost in credit for a short sale to be 85-160 (where the seller is more than 59 days late in payments). Moreover, this amount is practically identical to the number of credit points lost in an actual foreclosure. Therefore, if you think you are protecting your credit history by choosing a short sale over foreclosure, think again. As far as the lenders are concerned, both events have one key element in common: You did not honor your contract and pay as agreed. And in the world of credit report companies, that kind of news can travel fast. Do Short Sales Damage Credit Less Than Foreclosures? There is a common misconception that the derogatory record of a foreclosure ruins credit more than the report of a short sale. It is true that a short sale offers sellers an advantage over foreclosure in that a short sale allows the seller to obtain a loan for a new home within two years, while the waiting period before buying a another home following foreclosure is typically five to seven years. 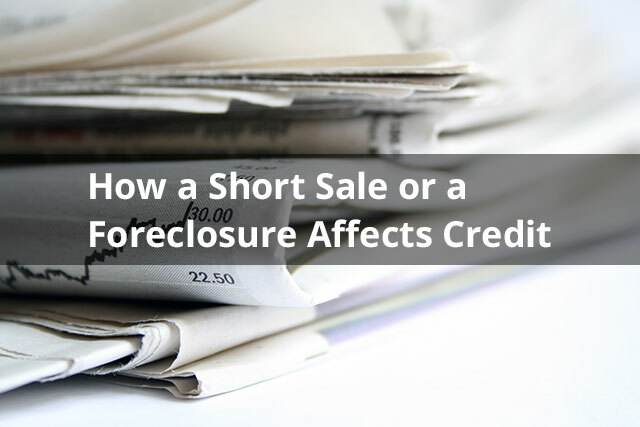 However, the bottom line is that a short sale offers no credit advantage over foreclosure and credit ratings are damaged in both cases. Since a credit report essentially attests to how well you manage money, even if your credit history takes a hit on account of a short sale in Florida, you can rewrite your own credit history by proving that you have become more financially responsible. So, even if you have to short sale your home, you don’t have to end up with the short stick; take action and start rebuilding good credit right away. Contact NSH Mortgage Lender In Florida Today!